There are so may things about life right now that are tiresome and even more things that are wonderful. I think I’ll ramble on about the wonderful for a bit. My two obsessions right now are the kitchen and the camera. My husband recently commented on the fact that the tripod has become a permanent fixture of the kitchen. I spend what free time I have cooking and baking and then taking pictures of my creations. I am getting a little bit better about posting things to Flickr so you should visit there sometimes. 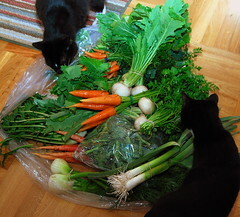 Thursday is our second date with Mariquita Farm and her wonderful Mystery Box. I love the Mystery Box for two reasons. The first is that it leads us to an increase in our vegetable consumption, which is always a good thing (not to mention these are locally grown and organic!). The second and perhaps most exciting reason is the challenge to use up all this produce.This is not an easy challenge since there is A LOT of produce in this package (well considering there are only two of us) and some of this stuff I have never even heard of, let alone met in person. Some of the highlights: an all vegetable Shepherd’s Pie (filled with chard, turnips, carrots, shallots, rapini, leeks, fennel, spring garlic and topped with sweet potatoes) and Meyer Lemon Crème Fraîche Pasta with Rapini. I still have a couple of turnips and a bunch of parsley left over that I need to work with and there was one vegetable that was entirely too bitter for me to use, but ultimately it was a success and I’m going to do it again. The challenge this go-round is that my partner in crime will be traveling a lot which means there will only be me to feed. I guess that means I’ll have to figure out some good recipes for freezing. On a slightly unrelated note, my dear friend wrote an amazing post about her 5th graders perspective on politics. I think this might be the best article I’ve read on politics this election season. I’ve had a strong desire to own and ride a scooter since I got my drivers license. I wanted to have a Volkswagen Thing and a Vespa, they were my dream automobiles. My first car was a VW Beetle and that helped curb my desire for an old VW, but I have yet to quench the Vespa thirst. A couple of interrelated goals on my list are to own a scooter (I’m currently torn between the Buddy Italia and the Vespa GTV) and to complete a motorcycle training course to get my motorcycle license. The latter of these two is officially complete! Last Wednesday I attended the classroom portion of the motorcycle training and then bright and early Saturday and Sunday I hit the range for 10 hours worth of drive time and on-the-bike instruction. After being on a motorcycle for two days, I started wondering if perhaps I would rather have a bike instead of a scooter. Only time will tell which two-wheeled machine will make its way into my heart.